It required a bit of an ethical adjustment. Here I was, sitting patiently in a blind, watching a tethered European Starling on a string. When a hawk came in at a good angle towards the ridge where we were perched, either the starling or one of the two Rock Pigeons beside it would get a little tug, enough to make them flutter haplessly. Enough to draw the attention of a predator. If we were just birders, or photographers, this would be dreadful behavior, but we were here to watch people engaged in Science. And Science requires Sacrifice. Do I sound facetious? I’m not. 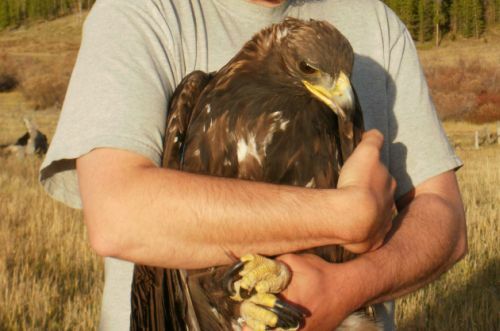 The aim of the game was to band raptors, and specifically to band Golden Eagles. To assess their populations, draw their blood, test them for lead, and discover what kind of impact feeding on gut piles might have on these iconic raptors, particularly the young ones, as hunting season begins in Montana. To gain knowledge of migration routes, wintering sites, survival rates. To understand, and thus to protect. To gather vital information that could make the difference between a thriving Golden Eagle population and a declining one. I couldn’t help but feel kind of bad for the Starling, though. It was the only bird I could see through the narrow slit in the blind, and so, as a bird-watcher, I watched it. It had a little shelter, a box that served as a windbreak and retreat, but this Starling was bold — it kept coming out to stretch its legs and sun itself. Sara, one of the researchers, explained that it was a newish bird. It hadn’t spent much time on the mountain yet and didn’t know its role in this little drama. Sara and the other scientists actually expressed a lot of sympathy for their Pigeons and Starlings. They made scrambled eggs for the bait birds each morning and fed them special premium mealworms to help them ward off the cold of the mountain and the stress of their daily grid. After a few shifts on the mountain, the birds were taken back to the dump where they were originally captured and released. Any bird that was wounded — and a bander could often prevent that fate by firing the net quickly enough — was nursed back to health. And I confess, a lot of thinking about the Starling was just from it being a slow migration day. Ravens made feints at the fake owl set further up the ridge as another attractant, Mountain Chickadees called behind us, but the hawks only trickled in. A single Northern Goshawk, a single Merlin, a handful of Sharp-shinned Hawks, and a slow but steady train of Red-tailed Hawks and Golden Eagles that never came close enough the our position to even take note of the fluttering birds. I am forced to confess this because when a Sharpie finally did come in on the Starling, I was as enraptured as everyone else. Both birds shrieked at each other in the moment before confrontation. 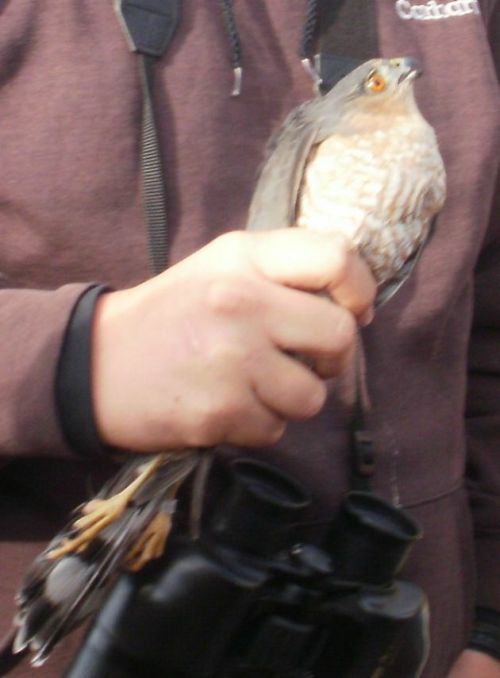 Rob skillfully netted the accipiter without letting it touch the bait, and we all crowded round. She was a fine-looking adult female, more than a little annoyed with us. We watched as she was banded and measured and inspected for parasites. The Starling was forgotten. 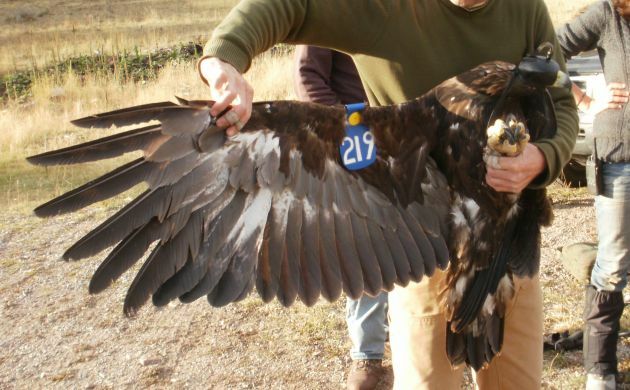 Then word came up via the walkie-talkies that a second-year Golden Eagle had been netted at another location, lured by roadkill that the team had dragged to a field and set up to be meatily visible from the air. The day being nearly done, we decided to trek back down the mountain to see this one rather than risk no Golden Eagles at all. “Is the Starling ok?” another birder asked me as we huffed two miles back and two thousand feet down to the parking lot. “I think so,” I replied. But I doubted it was very happy. We watched as the team banded the Eagle and drew blood, attached a wing tag that would be visible in a spotting scope, and explained how they used molt patterns to age the bird (sexing would come only with the blood analysis, but they guessed it was a male.) We watched as they fed it chunks of white-tail backstrap to help balance out the stress they’d caused it when it thought it was getting an easy meal. Then we watched as the took it back to the field a tossed it into the wind, from a slope so it would have the best glide path to sort itself out and recover from the confusion of what, they joked, must be very like an alien abduction. As we left, the team was preparing to break down the blinds and carry the Starlings back down the mountain for a night of rest and a good scrambled-egg breakfast before they did it all again the next day. Thank you, brave Starling. I salute you. The eagle is one of the most powerful raptors in the world. If they are in a good health, they have nearly no natural enemies. Where Are You Birding This Second Weekend of October 2013? Everglades Long-Legged Birds Feed Their Young To Alligators, Everything is Good.